Main Setlist: Caroline, Somethin'bout you Baby I Like, don't waste my Time, 4500 Times, Rain, All Stand Up, Solid Gold, The Oriental, Creepin' up on you, Mystery Medley, Belavista Man, The Party Ain't Over Yet, Gerdundula, Roll over lay Down, Down Down, Whatever You Want, Rockin'all over the World, Proposin' Medley, Junior's Wailing, Rock'n Roll Music/Bye Bye Johnny. Tour Crew:Dave Salt (Tour Manager), Lyane Ngan (Band Personal Assistant), Andrew Carman (Stage Manager), Pat Marks (Lightning Designer), Andy May (FOH Sound Engineer), Tim Franklin (Monitor Engineer), Lloyd Gilbert (Guitar Tech), Willem Calluy (Keyboard / Bass Tech) Merchandiser: Mike Hrano for Finally Fan-Fair Ltd. Management: DurocMedia Ltd. Manager: Simon Porter. Tour Note: 11 shows were cancelled due to Rick's throat operation. 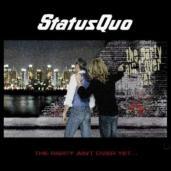 9.9.2005 - Quo played their first live radio session for decades on BBC Radio 2 on September 9th. 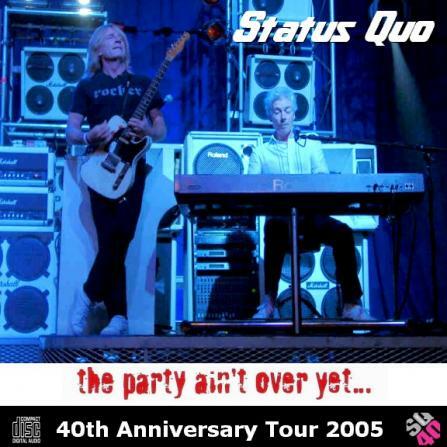 As part of the Ken Bruce Show, Quo played five songs live from the Maida Vale studio. First up was "Caroline", then "The Party Ain't Over Yet", "Whatever You Want", "Bellavista Man" and "Rockin' All Over The World". 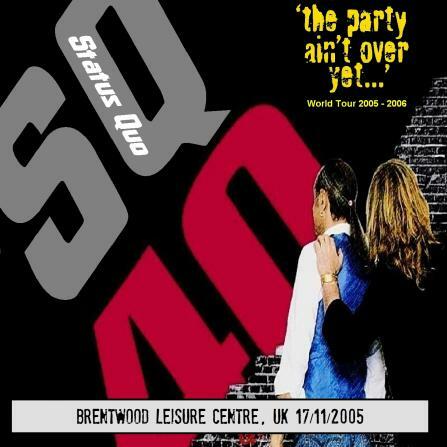 Ken Bruce also interviewed the band between sessions and a few lucky competition winners got to be in the studio for this live session. 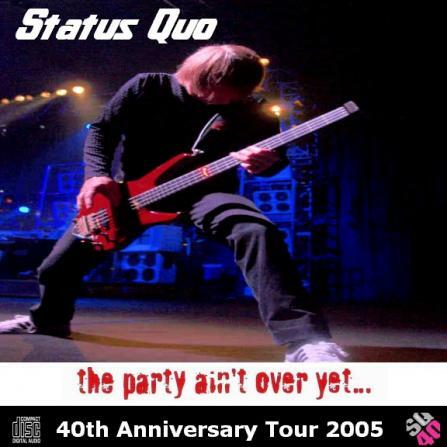 16.9.2005 -Quo performed for two nights at the Carnival City Casino, just outside Johannesburg on September 16th and 17th. 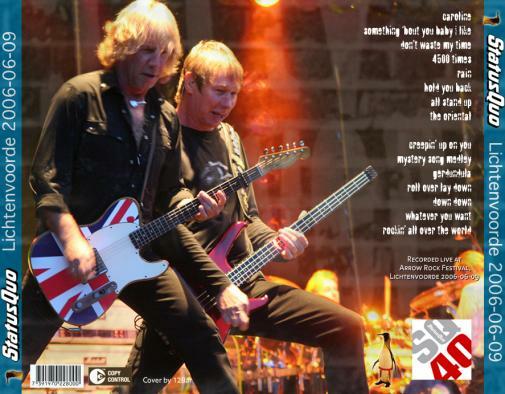 This was the band's first visit to South Africa in almost 20 years following their ill-fated gigs in Sun City 1987. This time, the gigs served as breaking grounds for two new 'The Party Ain't Over Yet' album tracks in the live set. 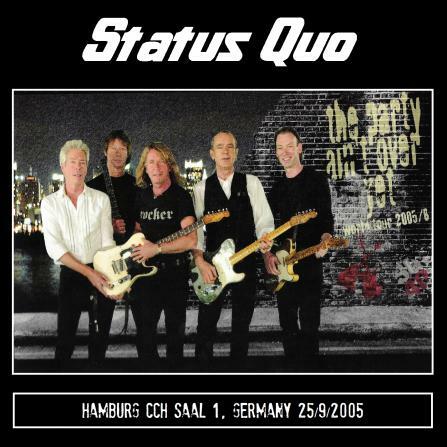 11.10.2005 - Quo appeared on the high-rating German TV show "TV Total" (Pro Sieben channel). They played "Rocking All Over The World" and "Whatever You Want" (both songs being interrrupted by advertisements), before a live performance of "The Party Ain't Over Yet". Rick and Francis were also interviewed by comedian & musician Stefan Raab to promote the new album. 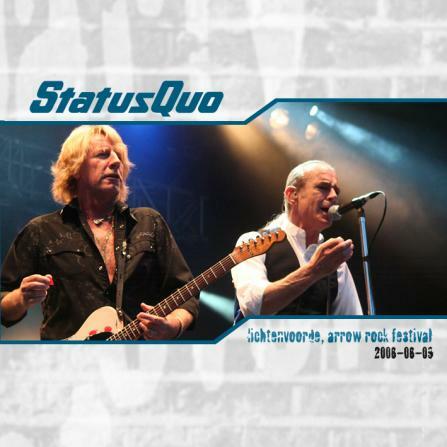 The following press release appeared on the official Quo web site on December 8th to inform gig-goers that the remainder of the UK tour had been cancelled due to the discovery of throat problems for Rick Parfitt. The cancellation was widely reported in the UK and overseas press (making a number of papers as far flung as Australia!). 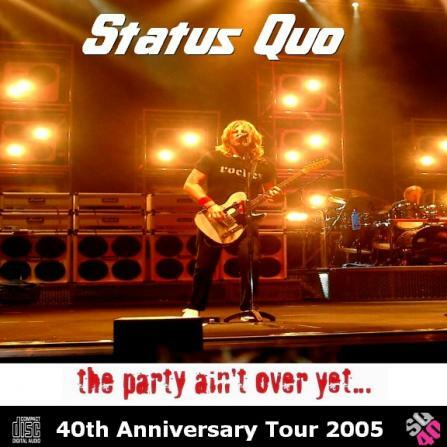 Duroc Management and Clear Channel Entertainment regret to inform the public that the current Status Quo UK tour will be cancelled with immediate effect. Guitarist and Founder member Rick Parfitt has been suffering from a throat problem. Simon Porter, the band's manager, said, "This morning he saw Consultant Stephen Toynton ENT surgeon at the Nuffield Hospital in Plymouth who has expressed concern with a growth in Rick's larynx and has recommended that it requires urgent investigation. Consequently all 9 shows on the current sell out UK tour have been cancelled. 23.4.2006 - Quo's first live gig of 2006 (following their enforced downtime due to Rick's illness) took place on April 23rd, high up a Swiss mountainside at Samnaun Alp Trida to an enthusiastic (and record-breaking) crowd of 11000. The show was an early start at 12:30pm. 11.6.2006 - At the now-traditional after-race gig, Quo performed again at the British Grand Prix at Silverstone. Supported by Rick Parfitt Jnr (watched proudly by Rick Parfitt Snr! 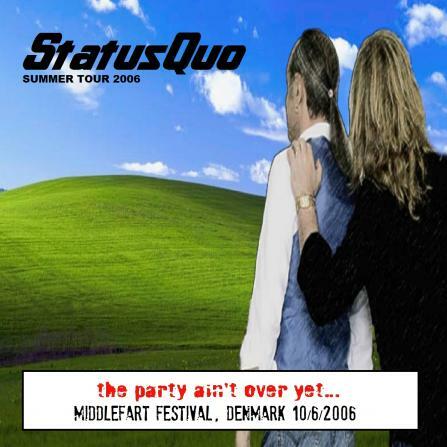 ), Quo played the familiar festival set. 20.8.2006 - Quo had to stop their open-air gig in Graz, Austria during "The Oriental" when Francis got electric shocks and the power went off. Obviously heavy rain got into the electric circuit of the power system after a thunderstorm.